It was great getting back in the kitchen since my little AZ vacation last week. It’s always nice to have others do the cooking from time to time and of course eat out (which I did way too much of)! I picked up a couple boxes of Raisinets at the grocery store yesterday while my 3 year old asked for EVERYTHING in sight, and decided they would make a fantastic cookie. Let me tell you they did not dissapoint! This is a fun spin on the traditional oatmeal raisin cookie and we loved them. I’m always looking for something fun to add into my cookies. Next time you are at the grocery store pick up a couple boxes, you’ll love these! 1. Preheat oven to 350 degrees F. Place butter and sugars into a stand or electric mixer; beat until light and fluffy. With mixer on medium add egg and vanilla until well combined. Place flour, soda, salt and oats into a large bowl. Slowly add to wet ingredients until just combined. Add raisinets; stir to combine. 2. With a medium cookie scoop, scoop dough onto a parchment or silpat lined baking sheet. Bake for 9-10 minutes. Let cool on baking sheet for 5 minutes then transfer to a cooling rack. Enjoy the rest of your week! I’ve got a finger licking weeknight dinner that you’ll love, so come back soon! 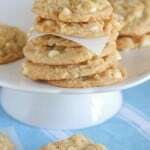 What a fabulous twist to oatmeal cookies. I haven’t thought about Raisinets in years! Raisinets are my favorite movie snack. I love this idea! Oh yummy yum…you see I would have added raisens and chocolate chips, but thats why you are the bomb girl, you are always thinking ahead of us!!! LOVE EM! I love chocolate covered raisins-and haven’t bought any in I don’t know how long…and I love oatmeal cookies..so I just KNOW these are gonna be great! I can’t wait to try these, Jenny. Great idea adding them in the cookies! Jenny that cookies look delightful! I haven’t had raisinets in a long time – what a great cookie! what a fabulous idea! I’ll def be trying this out soon. Oatmeal raisin cookies are the best, even better with raisinets!! mmm, I love chocolate in cookies (who doesn’t?) and I love raisins in cookies, how have I never thought to put raisinets in there?! Sounds awesome. These look fantastic! Will definitely be making them for my family this weekend! Oh my gosh, it has been way too long I haven’t had this raisinet. I used to nibble on this delicious raisin covered chocolate. What a clever idea to use them for your cookies. I bet they are really delicious. Raisinets? That’s great! I have to make these. How have I not thought of this before?! Brilliant! Ah ha! My mom used to do this and we loved them. Of course having extra to eat while baking was fun too. Thanks for the reminder. Oh wow! What a great idea! I want to try making these, but we don’t have Rasinets in Canada that I have ever seen, but we have Glossette’s Raisins. I think they are the same thing just different brands. But could someone tell me the net weight of the box of Rasinets used in this recipe? I wouldn’t want to short myself any! I just edited the box size in the recipe. Thanks for catching my error!! Hope you enjoy! Awesome! 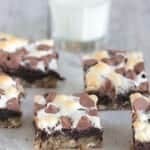 I loved when you did Cookie Dough Bites in cookies and these look great, too! I can see you strolling down the candy aisle with the wheels a turnin’. Well I had rasinets until my hubby go into them, these look wonderful jenny! We must be on a oatmeal cookie thing this week. These ones look delicious! I’m doing oatmeal week on my blog and it seems like everyone else is too! I’m probably going to link to this in the next few days if that is okay with you. If not, shoot me an email. what a great idea! I would have never thought of that. I bet they were tasty!!! Why didn’t we think of this before?? Such a great idea. Your creativity is endless! Ooooooh! I love raisinets! What a fantastic idea!! This is the only candy my mom likes so this will make for a great treat! Quick question-what crockpot would you reccomend? I am in the market! Thanks Jen!! Yummy do these sound soo good. I missed your posts while you were in AZ Jenny! made them…LOVED them! thanks so much! Oh these would be a fantastic treat, especially for kids! Don’t you just love how they absolutely NEED everything when you go to the grocery store? I am seriously loving this idea of raisinets in the cookies! I just have a cheapie crockpot by Rival, but I have been looking at the All Clad one that William Sonoma sells, I think it’s around $150. It is also programmable rather than low or high heat. Have fun shopping around! I’ve had a similar recipe in my to-try file forever. I love the idea of adding the Raisenets. These look wonderful. What a clever idea! FYI: I saw you last night on I believe a re-run of a burger challnege! What a great idea! I bet even my youngest would love those cookies… he’s not a fan of raisins, but cover them in chocolate and I bet he’ll be all over them. OMGosh! You never cease to amaze! I have to admit I’ve been avoiding your blog the last few days cause I didn’t want to see the fish recipe again and be disappointed. But after seeing THIS recipe, I have learned my lesson!! I’m linking to you today! Let me know if you need me to change anything. Nice and fun idea Jenny! It’s like having chocolate chips and raisins all in one! Lovely! Great idea. I wonder if there’s a way to get something else into that cookie: popcorn! Made these yesterday! Wonderful cookie! Thanks again! I recently found your site and absolutely love your recipes and photos! I’ve always loved to cook but am a fairly novice baker and for some reason, my oatmeal cookies always turn out puffy. I just made your Raisinet Cookies (a childhood favorite candy) and they too barely spread at all while baking. Do you know why this happens? Thank you and have a sunny weekend! Totally made these cookies for work.. and everyone loved it!! I’m going to put nuts in my next batch!! Great idea..